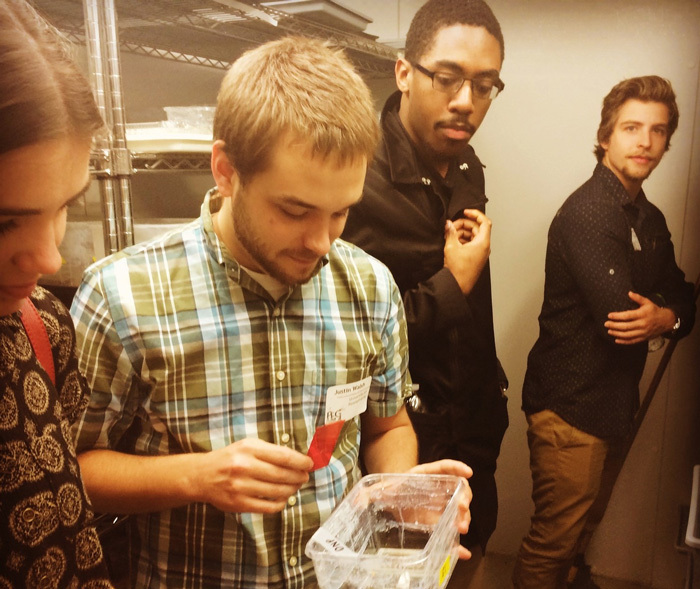 Third-year graduate student at University of Pennsylvania, Justin Walsh, gives undergraduates from Rowan University a tour of the room where ants are propagated for his research. From left to right, Angela Memmo, Justin Walsh, Tyrell Harris and Chance Weinberg. Guest post by Aurora MacRae-Crerar. Hosted at the University of Pennsylvania, this year’s Evolution in Philadelphia Conference (EPiC) aimed to foster collaboration among early career evolutionary biologists. The conference was sponsored in part by the Genetics Society of America (GSA) through its Career Development Symposia program, which supports events that contribute to the career development of early career members. The intellectual input that comes with sharing and discussing ideas is a vital part of the scientific process, and the conference provided substantial opportunities for early career scientists (ECSs) to showcase their work, practice presenting, and receive constructive feedback from their peers. The Philadelphia Evolution Group organizing committee saw the opportunity to bring together ECSs with similar research interests from all of the universities in the broader Philadelphia area, allowing the participants the opportunity to build lasting research relationships and collaborations with other students and postdocs. The symposium provided great networking opportunities for all involved; undergraduate students interested in research careers learned about graduate school, senior graduate students explored possibilities for postdoctoral research, and postdoctoral researchers learned from assistant professors about their experiences setting up their own research lab. The organizing committee, who worked tirelessly to bring the ninety-one attendees from over twenty schools together for this event, was led by Emily Behrman (graduate student, University of Pennsylvania) and Katie D’Amelio (graduate student, Drexel University), Jacob Russell (Associate Professor, Drexel University) and Rob Kulathinal (Assistant Professor, Temple University). In the opening keynote, Mary Caswell Stoddard (Assistant Professor, Princeton University) explored mimicry, mechanics, and macroevolution in avian eggs, while the closing keynote by Sarah Sander Lower (postdoctoral researcher, Cornell University) covered the evolution of firefly bioluminescence. Bird eggs and bioluminescent fireflies weren’t the only subjects explored; speakers presented on a diverse array of organisms, from deep-sea tubeworms to Northern Fur Seals to urban ants to chimpanzee gut microbes—and many more. Such an eclectic and exciting collection of study organisms is fitting for a conference about evolution, the process that has resulted in the biodiversity of all lifeforms. Student research was front and center at EPiC. Students had the opportunity to highlight their work in talks and posters—and through boisterous conversation over food and drink. Lehigh University swept the competition for best student talk. First place winner Dan Marad of the Lang lab talked about his work on adaptation rates in haploid and diploid yeast. Also from the Lang lab, second place winner Katie Fisher presented her research on intralocus sexual conflict in evolving yeast populations. In third place, Michael McQuillin from the Rice lab talked about the potential for cognitive ability to act as a reproductive isolating barrier. The prize for best student poster was awarded to Walker Alexander of the Gonder Lab at Drexel University for his presentation on understanding chimpanzee trafficking using population genetics. Alex Berry of the Brisson Lab at the University of Pennsylvania won second place for his work on the migration of the Chagas disease-causing parasite in urban environments. Finally, undergraduate student Joseph Scavetta of the Vojvodic lab at Rowan University won third place for his explorations of disease resistance in the acorn ant. EPiC also provided undergraduates from Svetlana Vojvodic’s lab at Rowan University with the opportunity to tour the lab of Tim Linksvayer at the University of Pennsylvania, giving them wider exposure to how research is undertaken outside their own institution. Lab tours like this one play an important role in fostering a sense of belonging among budding scientists and strengthen the scientific community as a whole. From newly minted professors to undergraduates starting their scientific journey, the early career scientist community was well-served, and the conference was nothing short of EPiC! If you are interested in organizing your own GSA Career Development Symposium, the next round of proposals are due January 10, 2018. The funding allows student and postdoc members to organize local symposia that provide career and professional development opportunities for other early career scientists. Examples could include career skills symposia and networking events.